We’d love your help. Let us know what’s wrong with this preview of This I Would Kill For by Anne Buist. Turns out Jenna and Malik’s break-up is anything but simple. He claims she’s crazy and compulsive; she claims he’s been abusing their daughter Chelsea. But what if all the claims are t Natalie King has been hired to do a psychiatric evaluation for the children’s court. A custody dispute. Not her usual territory, but now that she’s pregnant she’s happy to do a simple consult. To ask other readers questions about This I Would Kill For, please sign up. This I Would Kill For is the third book in the Natalie King, Forensic Psychiatrist series by Australian psychiatrist and author, Professor Anne Buist. As it follows on almost directly from Dangerous To Know with many characters in common and minimal recap, readers will do well to read both earlier books first. Having prepared what should have been a routine psychiatric evaluation in a custody case, forensic psychiatrist Natalie King is dismayed to find herself in court when the mother, Jenna Rad This I Would Kill For is the third book in the Natalie King, Forensic Psychiatrist series by Australian psychiatrist and author, Professor Anne Buist. As it follows on almost directly from Dangerous To Know with many characters in common and minimal recap, readers will do well to read both earlier books first. Having prepared what should have been a routine psychiatric evaluation in a custody case, forensic psychiatrist Natalie King is dismayed to find herself in court when the mother, Jenna Radford complicates matters with a claim against her ex, Malik Essa, of the sexual abuse of her eight-year-old daughter, Chelsea. Natalie’s qualifications have the magistrate involving her even more deeply in the case. As it becomes quickly clear that Jenna will lie whenever it suits her purpose, Natalie is faced with several questions: is the abuse real, or a fabrication? If so, is Malik the abuser? If not, then who? Knowing that Chelsea’s safety and happiness are at stake, Natalie has to tread carefully. Natalie’s personal life distracts her from the case: newly pregnant, her baby’s paternity is yet to be established, and interactions with the potential fathers are, to say the least, spirited. And is it her pregnancy, or the case, that is making her revisit the mystery of her own father’s identity? Against the backdrop of the Royal Commission into Child Abuse, Buist’s tale demonstrates how some of the players deciding a child’s custody may have their own agendas, be they political correctness and being seen to do the right thing, or keeping to a budget and staying under the media radar. The far-reaching effects of opinion pieces in print media, and reaction on social media as racial and religious prejudices are aired, are also shown as Natalie temporarily enters the Twittersphere. This instalment develops an already fascinating character by expand her backstory: pregnancy adds another dimension and, without her motorcycle and her booze, Natalie gets her kicks from driving a borrowed Lotus, having lost none of her passion for life nor her sexual appetite. That said, none of Buist’s characters are stereotypes: each has depth, and some will surprise as the story progresses. Bob the cockatoo in eerily prescient with his misquotes. As always, Buist gives the reader a plot that is original and believable, with more than one twist to keep the reader guessing right up to a heart-stopping climax. Her expertise in the mental health field is apparent in every paragraph, and while she ties up quite a few loose ends into neat bows by the end, fans can only hope that Buist will dream up a few more challenges for Dr King. Buist is certainly setting the bar high for her next literary foray: this one has to be her best yet. Another brilliant read! Nowadays I rarely read the Bible, but Anne Buist’s third book in the psychiatrist Natalie King series This I Would Kill For sent me digging out my battered King James version to refresh my memory of King Solomon. When two women appear before Solomon, both claiming to be mother of an infant, he calls for a sword. ‘Divide the living child in two, and give half to one and half to the other.’ The first woman begs to spare the child’s life and forfeits her claim. The other says, ‘Let it be neither th Nowadays I rarely read the Bible, but Anne Buist’s third book in the psychiatrist Natalie King series This I Would Kill For sent me digging out my battered King James version to refresh my memory of King Solomon. When two women appear before Solomon, both claiming to be mother of an infant, he calls for a sword. ‘Divide the living child in two, and give half to one and half to the other.’ The first woman begs to spare the child’s life and forfeits her claim. The other says, ‘Let it be neither thine nor mine, but divide it.’ Solomon, in his wisdom, determines the first woman to be the child’s mother. In This I Would Kill For, Natalie King, motorbike-riding, rock-singing psychiatrist is called as an expert witness in a custody battle between Malik and Jenna Essa. Malik is father to three-year-old Chris and step-father to Jenna’s eight-year-old daughter, Chelsea. Jenna will do anything to retain custody of her children. But will she go so far as to commit perjury? And is the good-looking Malik really a psychopathic ‘fox in the henhouse’ or dedicated to the children’s welfare? It’s up to Natalie to present the facts to the court. When Chelsea’s behaviour points to potential abuse, the custody battle turns savage. Jenna is sure Malik is the abuser while Malik hints Jenna is an unfit mother. Does Natalie King possess the wisdom of Solomon to determine which parent is lying? If she doesn’t get it right – Chelsea will be handed over to a potential abuser or be denied the love of a step-father genuinely concerned for her welfare. Natalie King is a complex character with her own problems. Her recent pregnancy (paternity unsure) and her growing preoccupation with the identity of her own father may be clouding her judgment. But she must make choices. Does she go with her gut instincts, to the peril of her career, her lover or her own life? Buist, a psychiatrist and Chair of Women’s Mental Health at the University of Melbourne with experience in protective services and the legal system, paints an accurate and compelling portrait of parents at loggerheads over their children, unwilling to give an inch, a position reflected in Natalie’s lover Liam’s own marriage. There are intriguing threads throughout the novel and it is unclear who is the abuser, particularly with a few tantalising red herrings sprinkled throughout. The court scenes are compelling and I felt as if I was present, watching the volleying of evidence and opinion. The novel provides an interesting insight into the challenges facing psychiatrists, social workers and judges – who forced to make tough decisions are often vilified by the media. Buist examines the rigid opinions voiced in mainstream and social media (both left and right, cultural and religious). She muses as to whether child welfare is being sacrificed on the altar of political correctness. This was my first journey into the trials and tribulations of psychiatrist, Dr Natalie King, thanks to the generosity of the publishers in a Goodreads giveaway. Dr King is drawn into a web of family drama with a battle between parents for their two children. What comes next is a series of doubt-riddled moments, with more twists and turns than a pretzel. It took me a little brain work to catch up on the main characters’ backstories, but once I did I sprinted along with the plot. Worth a read for This was my first journey into the trials and tribulations of psychiatrist, Dr Natalie King, thanks to the generosity of the publishers in a Goodreads giveaway. Worth a read for fans of psychological thrillers. Forensic psychiatrist Dr Natalie King has been hired to do an evaluation. This psychiatric evaluation is required for a custody dispute in a case before the children’s court. While this is not Natalie King’s usual area of work, she’s happy to do what should be a routine consultation now that she’s pregnant. But there’s nothing routine about this case. Jenna Radford and Malik Essa each see the other as being the problem. Malik says that Jenna is crazy and compulsive. And when Jenna accuses Malik of abusing their eight-year old daughter Chelsea, the magistrate hearing the case asks Natalie to investigate further. This is a difficult investigation for Natalie. She desperately wants to protect Chelsea. On a personal level, the paternity of Natalie’s child has yet to be established and being pregnant has raised several issues. Natalie did not know her own father and she wants to find out more about him. While being pregnant is an added factor as Natalie as tries to effectively manage her Bipolar Affective Disorder. Personal and professional issues are both causing Natalie stress. While Natalie is quick to establish that Jenna will lie whenever necessary to suit her purposes, it’s necessary to prove (or disprove) her claims in order to protect Chelsea. In the meantime, someone has abused Chelsea: is it Malik? If it isn’t Malik, who is it? The Royal Commission into Institutional Responses to Child Sexual Abuse provides part of the backdrop to this novel, and everyone is acutely conscious of this. Jenna’s lies, Malik’s anger and Natalie’s preoccupations will all have a part to play in this complex story. Different psychiatric opinions will also cause Natalie concern. Natalie King is a complex, likeable, flawed hero who continues to struggle with her own demons. I like Anne Buist’s portrayal of a strong woman with mental illness, trying hard to function effectively in what can be a hostile world. This is the third book in the Natalie King Forensic Psychiatrist series and while I’ve yet to read ‘Medea’s Curse’ (the first novel) I think that this series is best read in order. I’ve picked up quite a bit of Natalie King’s backstory from ‘Dangerous to Know’ (the second book), and the backstory is important in this series. This is a series that started out with much promise, which alas hasn't been delivered in THIS I WOULD KILL FOR. On the psychological thriller side of the equation, this was deeply unconvincing. A child abuser that was obvious from his first appearance, a central protagonist that's gone from a bit of a maverick to unprofessional, wilfully childish and tiresome; and a storyline balance heavily weighted towards too much of the personal, too much baby talk and enough fluff around the edges to make yo This is a series that started out with much promise, which alas hasn't been delivered in THIS I WOULD KILL FOR. This is the third and latest book in the Natalie King series, and is much like the previous ones. A typically complex case for the troubled forensic psychologist - difficult judgements to make, lots of ins and outs to work through – and is a compelling and engaging psychological thriller that keeps the reader involved and guessing to the end. A good read. This I Would Kill For is a relatively quick read as the story runs along at a surprisingly fast pace and I found myself jumping to my own conclusions. I was actually surprised to find that this is number 3 in a series, as it most definitely reads very well as a standalone; I certainly didn't experience any detrimental effect from not having read the earlier two books. In fact I felt intrigued enough by the main character of Natalie King to want to read the previous books, so that's always a good This I Would Kill For is a relatively quick read as the story runs along at a surprisingly fast pace and I found myself jumping to my own conclusions. I was actually surprised to find that this is number 3 in a series, as it most definitely reads very well as a standalone; I certainly didn't experience any detrimental effect from not having read the earlier two books. In fact I felt intrigued enough by the main character of Natalie King to want to read the previous books, so that's always a good sign when a reader jumps in mid-series. I received an ARC from NetGalley and publisher Legend Press in exchange for an honest review. I am so pleased I requested this book! I don't think I have ever read a book similar to this and I was pleasantly surprised. I didn't realise it is the third in a series and while it is one of those detective-type series where you don't have to read the ones before it, there were still some rocky elements at the start which it took me a while to adjust to. However, after that I was completely hooked. This I received an ARC from NetGalley and publisher Legend Press in exchange for an honest review. This I Would Kill For is a book about a forensic psychiatrist who is asked to determine whether or not a child is being abused by their stepdad. The child's parents are separating and both of them want custody, even though neither is an ideal parent. This premise is handled brilliantly with the plot swerving you so at first you side with one parent, then you begin to doubt them and then even more doubt is introduced until you feel as uncertain as the main character. It really did keep me invested in the story and I read it very quickly to try and find out what was going on. Speaking of our main character, I adored Natalie. She is one of the most fleshed-out protagonists I have read about in a while and I loved that her personal life actually made up a fair bit of the plot. She was very likeable and her attitude towards the case went a long way in adding to the tension of what decision she would make. You really felt for her as a character. It was also nice to read about someone who isn't a police detective for once (and I don't just say that as a Psychology student). There were unfortunately just a few niggles which stopped me giving this 5 stars. As mentioned, the opening was a bit clunky for me and it took me a few chapters to work out what was going on. The ending also wasn't the best and it let the story down a little bit. Finally, I'm not sure the author understood how Twitter works? It seemed like everyone Natalie interacted with on Twitter turned out to be someone she knew in real life which...yeah no, the internet is a big place. Overall, I would definitely recommend this book and I am planning on seeking out the others in the series. If you want an engaging thriller which is a little different from the typical abduction/murder/domestic breeds, then you should definitely give this a try. I can't wait to read more from this author. Thanks to Text Publishing and the author for the free copy of this novel. I’ve not read any of the author’s previous novels and was expecting more of a gruesome murder mystery, not this sympathetic and humanist look at a very difficult and unsettling topic; child abuse. Natalie King is a forensic psychologist who is given the task of assessing an eight year old girl to determine if she’s being abused by her adoptive father. Natalie herself is dealing with mental illness and the consequences of one Thanks to Text Publishing and the author for the free copy of this novel. Natalie King is a forensic psychologist who is given the task of assessing an eight year old girl to determine if she’s being abused by her adoptive father. Natalie herself is dealing with mental illness and the consequences of one of her flare-ups, and rather than having all the answers, we share in her self doubt and the struggles she faces with the decisions she’s making. We also get to see the various different sides of the central story (and there are many of these), the child’s mother and father, her grandparents and those around her who are drawn into the situation. I found these were dealt with in a very sympathetic manner, with the author emphasising the “shades of grey” inherent in most relationships. She also understood all the many different points of view involved when the welfare of children is questioned. I found this novel riveting and hard to put down. I really wanted to know, not only who the bad guy was, but what happened to all the characters in the end, which is surely a sign that I related to and cared about them. 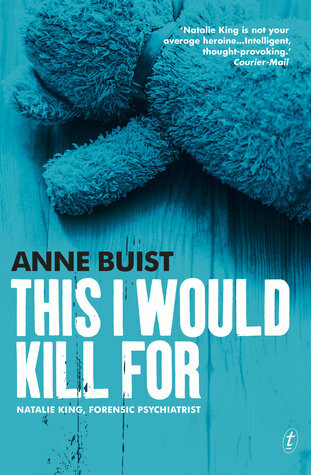 “This I would Kill For” by Ann Buist is the third novel in a series, and I didn’t realise it. Luckily I was able to pick it up and step right into the story. Synopsis - Psychiatrist Natalie King is the expert witness in a child contact matter in the Children’s Court. Getting it wrong means handing a child over to an abuser—or depriving that child of the only father she knows. The book had a lot of analysis and exploration into child/adult behaviour, the theme being sexual abuse and trauma. The Roy “This I would Kill For” by Ann Buist is the third novel in a series, and I didn’t realise it. Luckily I was able to pick it up and step right into the story. The book had a lot of analysis and exploration into child/adult behaviour, the theme being sexual abuse and trauma. The Royal Commission plays up in the background, adding another layer of trauma for outlier characters. The writing was never graphic, so don’t stress! Book focused on babies A LOT. Ms King is pregnant, so it’s babybabybaby all the way through. I did like her though, King is super cool, damaged and quirky. The writing made everything feel realistic and emotionally charged. So much was going on, with the court matter and the repercussions bouncing into her personal life. There was always this simmering tension – will she crack? Her personal life was just as interesting (and tense) as her work life. The character of Natalie has really grown on me as the series continues. She is complex, unpredictable and frequently imprudent, but her heart is always in the right place and she seems to be thinking more of others and less of herself as her character evolves. In this book, we see her coming to terms with impending motherhood but, in typical Natalie King fashion, she first has to figure out who the father is and which of her two love interests would be the best bet for her and her unborn child. The character of Natalie has really grown on me as the series continues. She is complex, unpredictable and frequently imprudent, but her heart is always in the right place and she seems to be thinking more of others and less of herself as her character evolves. In this book, we see her coming to terms with impending motherhood but, in typical Natalie King fashion, she first has to figure out who the father is and which of her two love interests would be the best bet for her and her unborn child. A surprisingly good read that got better with each page. The protagonist (Natalie King) is an interesting character - a bipolar psychologist who is smart, capable and more than a little flawed. Initially I had a hard time identifying with a woman who was not even sure who the father of her unborn child was. As the story progressed it became clear that Natalie was a good person doing her best in trying circumstances. The pacing was excellent and ultimately reading the book was a satisfying experien A surprisingly good read that got better with each page. As the story progressed it became clear that Natalie was a good person doing her best in trying circumstances. The pacing was excellent and ultimately reading the book was a satisfying experience which provides the reader with more than a little food for thought. I was intrigued by this book because of the title and the front cover. I didn't even realise it was part of a series but I was still able to read and enjoy it regardless. I think one of the main reasons I liked this book so much is because I liked the main character and was interested in the parts about her personal life as well as the interesting case she was working on. The first 80% of the book was a little slow but still interested me and I really had no idea who the abuser could be. The last I was intrigued by this book because of the title and the front cover. I didn't even realise it was part of a series but I was still able to read and enjoy it regardless. The first 80% of the book was a little slow but still interested me and I really had no idea who the abuser could be. The last 20% was brilliant and much more faced paced. After reading I am keen to read others in the series. I hoped for more - but the Twitter element in the book was annoying and unnecessary. More development of the characters without Twitter would have made it a better book. It was pretty easy to figure out the perpetrator and the failure of the protagonist to consider who it might be and why, was another annoying element. Also - a supposedly independent professional woman, albeit one who is bi polar, and who constantly takes her boyfriend's Lotus without asking. Really? Who is left to admire in thi I hoped for more - but the Twitter element in the book was annoying and unnecessary. More development of the characters without Twitter would have made it a better book. It was pretty easy to figure out the perpetrator and the failure of the protagonist to consider who it might be and why, was another annoying element. Also - a supposedly independent professional woman, albeit one who is bi polar, and who constantly takes her boyfriend's Lotus without asking. Really? This review has been hidden because it contains spoilers. To view it, click here. This is book three in the Natalie King series,and I haven't read the other two. That goes part of the way to me not being over enthusiastic about this one. There was a lot to catch up on... family,medical and love life all included. The main story line of Chelsea and her parents and was she or was she not being abused,and if so,by who.... that was interesting. You start to mistrust everyone,as essentially everyone was lying to get their own way. I'm afraid I found the whole Twitter thing distractin This is book three in the Natalie King series,and I haven't read the other two. That goes part of the way to me not being over enthusiastic about this one. This one was unique- some of the tropes were there: the mental health clinician is mentally ill herself AND off her meds, the mother reporting DV and child sexual abuse has her own secrets to hide, the cultural relativism card played in a sensational court case, but the author sets up the narrative and the characters in such a compelling way that it is still fresh and enjoyable. Interesting enough story, looots going on in here, felt a little like a textbook at times with lots of explanations and details about what behaviours the characters were exhibiting and why. The third (and arguably the best) instalment of the Natalie King series. A smart, well-written, flawlessly researched page-turner. Loved this book now want to read the others in the series. i really love Natalie with all her flaws. Couldn't put it down! Very well written with a compelling story that will leave you wanting more. Would happily read more of their work. The topic at hand has always interested me and seeing something like this is really good. The writing style was great but lacking interest for me in some parts. Professor Buist is married to novelist Graeme Simsion and has two ch Anne Buist is the Chair of Women’s Mental Health at the University of Melbourne and has over 25 years clinical and research experience in perinatal psychiatry. She works with Protective Services and the legal system in cases of abuse, kidnapping, infanticide and murder. Medea’s Curse is her first mainstream psychological thriller. Professor Buist is married to novelist Graeme Simsion and has two children.